I've let my squarespace trial expire, and I've changed things up here a bit. I wanted to be able to display larger images here, and blogger's templates were not keen on that. Those pesky sidebars always got in the way. So, here's a template from another site I'm trying out. I need to find (or snap!) a picture to use as my header. We'll see what I come up with. In the meantime, I hope you all find this blog easy to peruse (all the personal info, links and whatnot are now located at the very bottom). As always, feedback is welcome!! 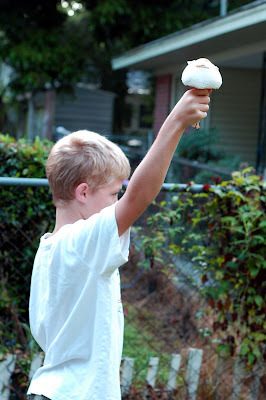 J plucked the largest mushroom from our yard this morning and proceeded to march around gallantly with it.